The presence of books in the home benefits the reading ability of children, says this article in the NY Times. Our New Directions Bookcase Wall can hold a lot of books. 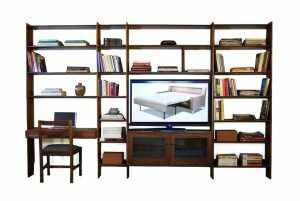 Our New Directions Bookcase Wall is available is virtually any dimension crafted in our Brooklyn workshop of solid hardwood. 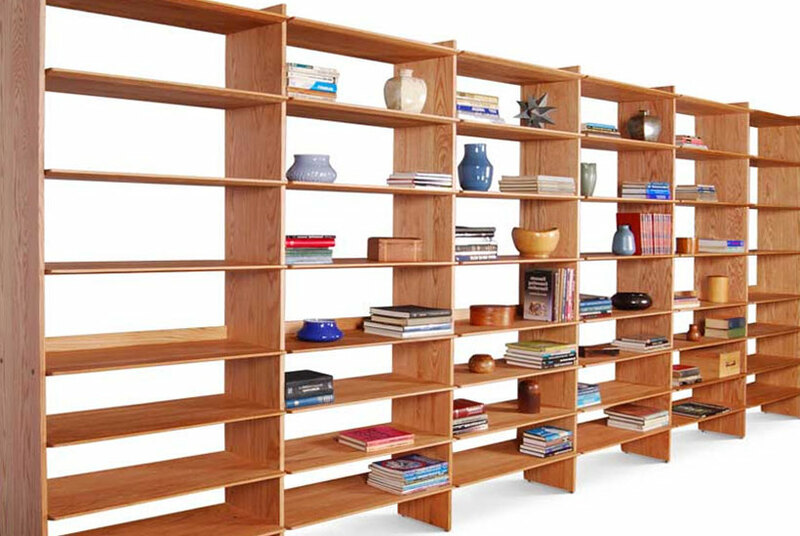 The New Directions Bookcase Wall System uses a combination of standard modular components and custom length shelving components to create a bookcase wall to the desired length and height. 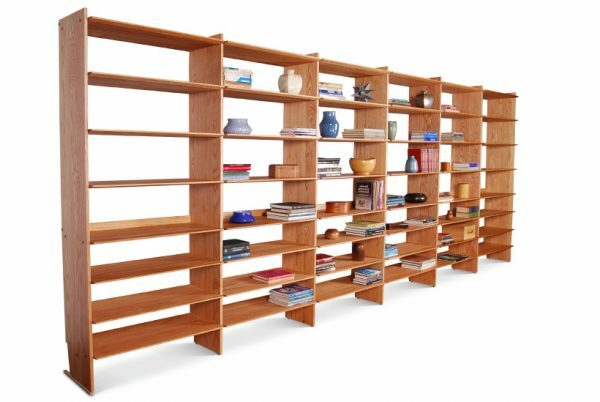 The long wall of bookcases pictured here is nearly 19 feet long – any length is possible. Choose standard vertical elements of 6′, 7′ or 8′ and shelving widths of 16″, 24″, 32″ and 40″ or specify custom sized elements for only slightly more. Our standard vertical elements at 10.25″ deep by .75″ thick. The standard shelves are 12″ deep by .75″ thick. The modular shelving units are connected by easy to install and hidden hardware connectors (Mini Zip-Bolts between units. bolts and barrel nuts at the end units). The hardware connections provide a rigid structure that requires no back. Safety requires that the units be fastened securely to the wall behind. The lower back edge of the bookcase is contoured to fit above a 9″ baseboard allowing the bookcase to fit flush against the wall. 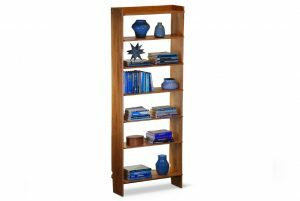 Our New Directions Bookcase Wall System are carefully crafted in solid, locally sourced hardwood; not plywood, not medium density fiberboard (MDF) – solid hardwood. Choose from cherry, birch, maple, oak or walnut. 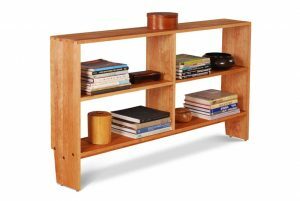 Solid hardwood is significantly stiffer than plywood and MDF – which means that the shelves won’t sag over time. And solid hardwood doesn’t emit toxic chemicals, like formaldehyde, into its environment. 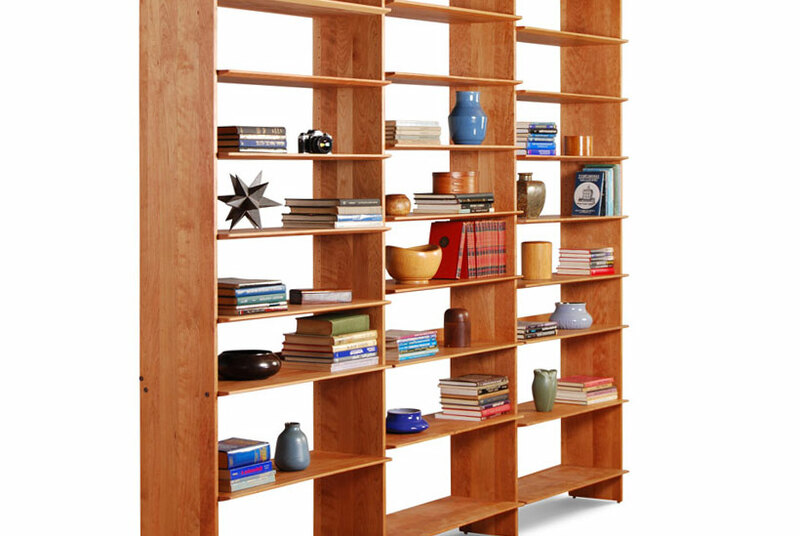 We finish our New Directions Bookcase Wall Systems with a non-toxic oil and wax finish. We offer cabinet modules to incorporate into our bookcase wall system; cabinets with doors, desks, etc. enabling the creation of multi-function wall systems. Our competence in computer aided design and manufacturing make this system possible at a surprising reasonable price. 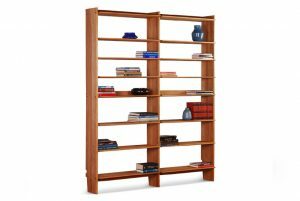 Please refer to the pricing data on our New Directions Double Bookcase for an indication of pricing. We also manufacture more traditional bookcase wall systems with many optional features – always from solid hardwood.